The Eastern Wood-Pewee is one of those birds that has the good manners to say its name. The plaintive ascending and then descending pee-ah-wee phrase can be heard throughout the day during the summer in the eastern United States The bird itself is quite inconspicuous as it hawks insects from high in the canopy. The Eastern Wood-Pewee breeds from southeastern Canada across the eastern states and migrates to northwestern South America during the winter. Description: This medium-sized olive-gray flycatcher is pale below with a darker wash on the breast and sides. It has dull whitish wingbars, and a dark bill with a yellow base on the lower mandible. This flycatcher has a very upright posture and will often repeatedly return to the same prominent perch when fly-catching. Males and females are alike in plumage. Voice: This flycatcher says its name with an ascending and then descending pee-ah-wee. Eastern Phoebes characteristically wag their tails, have an all-dark bill, and only indistinct wingbars or they lack them entirely. The Eastern Wood-Pewee is distinguished from all Empidonax flycatchers by their dark face with weak partial eye-ring, dusky vest, and grayish smudges on their undertail coverts. Olive-sided Flycatchers, present in Tennessee as migrants, have more indistinct wingbars, and larger and darker patches on the side of the breast that contrast strongly with a white center. They occasionally show white tufts on the sides of the rump. Habitat: Found in deciduous or coniferous woodlands and woodland edges, but also urban shade trees, roadsides, woodlots, and orchards to mature forest. Nesting and reproduction: The Eastern Wood-Pewee does not begin nest construction until mid-May. Clutch Size: Usually 3 eggs, with a range of 2 to 4. Incubation: The female incubates for 12 to 13 days. Fledging: Both adults feed the young, which fledge at 15 to 18 days. Nest: The female builds the shallow cup-nest on a horizontal branch away from the trunk. Nest heights in Tennessee range from 6 to 45 feet, with an average of 20 feet above the ground. Status in Tennessee: This is likely the most common flycatcher in Tennessee. It can be found during the breeding season statewide, arriving in late April and departing by early October. The population is possibly stable in Tennessee, but it is decreasing rangewide. 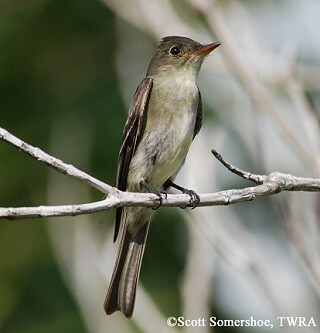 In a forest where several flycatcher species are found, the Eastern Wood-Pewee forages higher in the trees than the Least and Acadian Flycatchers, but lower down than the Great Crested Flycatcher. One potential cause of the decline of Eastern Wood-Pewee populations is the overpopulation of white-tailed deer in the Eastern forests. In areas with high deer density, the intermediate canopy is disturbed by browsing, affecting the foraging space of the flycatcher. The oldest known Eastern Wood-Pewee in the wild was 7 years, 1 month old. Best places to see in Tennessee: This species is found in woodlands in every county in the state. McCarty, J. P. 1996. Eastern Wood-Pewee (Contopus virens). In The Birds of North America, No. 245 (A. Poole and F. Gill, eds.). The Academy of Natural Sciences, Philadelphia, PA, and The American Ornthologists' Union, Washington, D.C.